Deirdre Cannon drew DNA “biology graffiti” in the atrium of the Gosnell building. Deirdre Cannon is a first-year biotechnology and molecular bioscience student from Norfolk, Mass., who loves drawing. Cannon enjoys creating with all types of mediums, from oil painting to digital media to chalk. 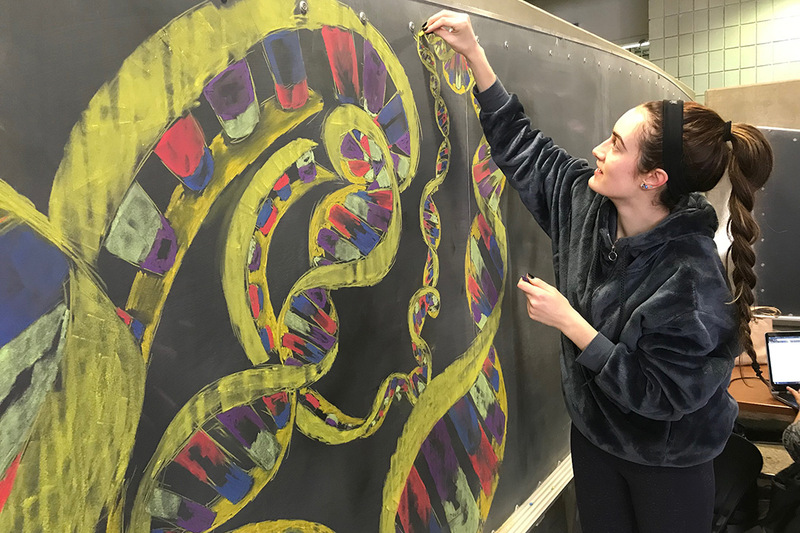 Recently, Cannon was able to combine her love for art and science to create “biology graffiti” to be used as a poster backdrop for RIT’s Howard Hughes Medical Institute (HHMI) Inclusive Excellence initiative. RIT’s HHMI Inclusive Excellence initiative, made possible by a $1 million grant from the Howard Hughes Medical Institute, is a five-year plan set forth by College of Science faculty, staff and students. The goal is to “foster a more inclusive environment across the college” through involvement with this initiative. Community Strand Lead Jennifer Connelly and faculty liaisons Dawn Carter and Beth VanWinkle from the College of Science are using art as a means of expression, inclusion and communication. Professor Carter and Professor VanWinkle asked Deirdre to be their first featured artistic scientist. As the initiative continues to grow, they will invite other students to create science-related art to use for decoration throughout the halls of the College of Science. Question: How did you get involved with the RIT HHMI Inclusive Excellence initiative? Answer: I honestly never heard of it until I went to Dr. Carter’s office, who is a professor of mine. I was looking for extra help on something, and we started talking about art and science, and she mentioned the bio graffiti. It was right before Christmas vacation, so when we came back from break, I talked with her more and she told me it was part of this Inclusive Excellence program. I still wasn’t sure what it was, but I told her that I would draw something for her. She wanted a photo with professor Beth Van Winkle down in the atrium, and she wanted me to draw a backdrop for them. Ultimately, she wants to get a bunch of student artists who are also scientists involved with the program. Question: How did you feel when they asked you to create a backdrop for one of their posters? Answer: I was really excited because I love art. When I do art, time just passes. I become oblivious and I just hyper-focus on my work. I remember when MAGIC Spell Studios opened, I was just drawing in one of their labs and, when I looked at the time, I realized my 5 p.m. lab was starting in five minutes. So, I had to run all the way to the dorms to get my lab coat, and then run all the way back to get to my class. I had a lot of fun with this project, it was a great opportunity. Question: Why did you choose the DNA design for your biology graffiti? Answer: Dr. Carter and I came up with the idea to have DNA be the subject. DNA is hard to draw, but it’s fun. It was a little difficult drawing it on a chalkboard because I had only drawn DNA and used chalk as a medium a few times before this project. Now that I did this project and practiced more, I know what it’s supposed to look like and it’s a little easier. I could have drawn a cell or muscle structure, but I decided to stick to DNA because DNA molecules are the building blocks of life and diversity. I knew Dr. Carter and Dr. Van Winkle wanted a nice photo, so I wanted to make sure it was really beautiful and caught people’s eyes. Question: What inspires you when you draw? Answer: I just come up with a lot of the things that I draw. I do love anime and surrealism, so I draw some inspiration from that. I really like surrealist paintings, galaxy art and other more abstract looking art. The surrealist-vibe is where I get a lot of my ideas from. I also like when things pop; I don’t like to create anything bland. For instance, if I decided to draw a still life, it’s just copying the item onto a piece of paper or canvas. When I do draw still life images, my thoughts are along the lines of, ‘let’s get this over with.’ I like to put my brain to the test in a creative sense. Question: Why do you think this initiative is important? Question: How do you think utilizing student art will help foster a more welcoming environment in the College of Science? Answer: Hopefully, more students will get involved with the program. If people know there are opportunities to feel special, showcase their work and showcase their passion for science through art, more people will want to be involved. People want to know what scientific subjects like DNA look like from different perspectives, they don’t want just what is available in a textbook. As an artist, I can manipulate scientific subjects into my own image, and that can influence people to learn more about my subjects. People don’t have to like it, they might hate it, but it shows that science isn’t just the stereotypical nerdy-discipline, it can be creative as well. Question: Do you think you will continue using your illustration skills in a scientific setting? Answer: Definitely. Art is my passion and it’s something that I’m never going to get rid of. If someone took a DNA test and they wanted to see their own DNA or have their own genetics hung up on their wall, I can create an artistic rendition of what their DNA looks like and tailor it to how the person wants it to look. I can also help design new hospital equipment and other products. You certainly need to know the physics behind it so it actually works, but there is still the design aspect of how it will look within the space it’s being used in.